Join Reboot Democracy for drinks, snacks, and an evening of engaging discussion! Early-stage project teams will share what they are working on, we’ll hear from a diverse group of expert speakers, and then we’ll open up the mic to anyone who wants to pitch an idea they are excited about before we break into networking. If you'd like to present what you are working on in the project showcase of our next event, contact us at hi@rebootdem.com! The internet has been hailed as an equalizer, enabling diverse voices to share their views. But today, many of the laws that protect speech online are being challenged, and the internet can often seem unwelcoming. 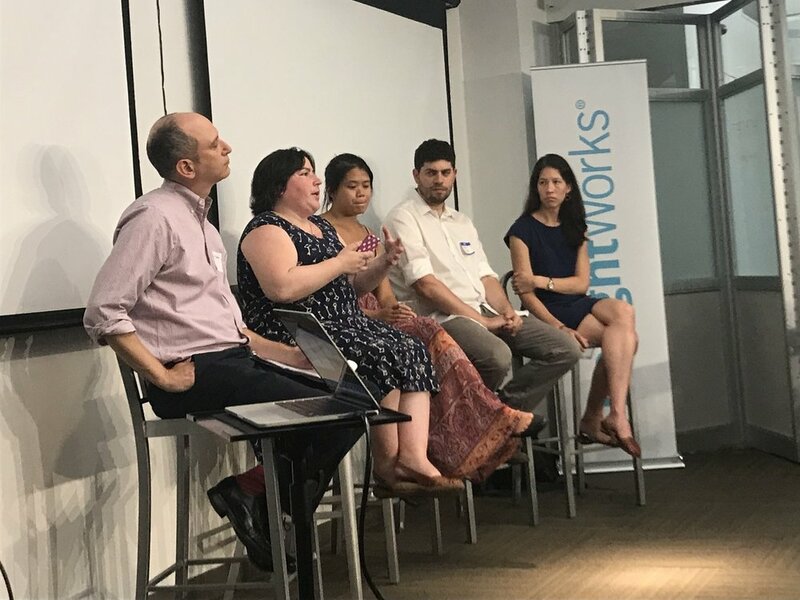 At the day-long Future of Speech Online summit, experts from across aisles and sectors brought powerful and sometimes provocative perspectives to move dialogues forward. As always, we closed out the night by opening up the mic to the audience before we broke into networking. Speakers included: Jen Poyant (Producer of ZigZag Podcast), Manoush Zomorodi, Lillian Ruiz (COO and Co-Founder of Civil), Christine Quinn, (President & CEO of Win and former Speaker of NYC Council), Marisa Kabas (Editorial Director at Crush The Midterms), Natalia Aristizabal (Co-Organizing Director at Make The Road), Stephanie Gent (Digital Strategy Director at Everytown for Gun Safety), Moira McDermott (21 in '21 Initiative), and a comedy performance by Cody Lindquist (co-host of Two Beers In: A Tipsy Political Roundtable podcast). Motivote was also onsite to provide voting accountability! The Harvard Business School Association of Northern California presented an expert panel including Gisel Kordestani (CEO of Crowdpac), Minnie Ingersoll (COO of Code for America), and Steph Hannon (CPO of Strava & former CTO of the Hillary Clinton campaign). Shireen Santosham (CIO, City of San Jose), moderated the discussion around the emerging focus on civic tech and how it will continue to shape the way people engage with government and each other. A public lecture by Cory Doctorow followed by a Q&A with Jad Abumrad. The techlash marks the end of complacency over Big Tech: in a single instant, states have gone from being blase about the risks of a monopolized digital world, to being certain that the answer involves limiting the digital monopolists. The MOST democratic future is one where everyone gets to hack, where we seize the means of computation and distribute it to everyone. In September, we hosted our first DC-based Reboot Democracy event. The community joined us for drinks, snacks, and an evening of engaging discussion! Early-stage project teams shared what they are working on, we heard from a diverse group of expert speakers, and then we opened up the mic to anyone who wanted to pitch an idea they are excited about before we broke into networking. In August, Reboot Democracy teamed up with New Media Ventures for an event focused on making every voice count in our democracy. The founders of Fund This, We Vote, Syndicator.io, BallotReady, CivicFeed, and Campaign Greenhouse shared what they are working on and we heard from a diverse group of expert speakers including Manny Yekutiel (Founder of the civic event space “Manny’s”), Jill Habig (Public Rights Project Founder & Open Society Foundations Leadership in Government Fellow), Osi Imeokparia (Chan Zuckerberg - Justice & Opportunity Initiative & former product leader at HFA, Google, & eBay), Lili Gangas (2018 New America CA Fellow and the Chief Technology Community Officer at the Kapor Center for Social Impact), and Shannon Baker (Director of Partnerships at New Media Ventures). Then we opened up the mic to anyone who wanted to pitch an idea they were excited about before we broke into networking. In July we teamed up with Progressive HackNight for an event focused on democracy tech in an election season. Progressive HackNight projects pitched what they're working on and got straight to work. Early-stage project teams Motivote, The Flip Side, MobilizeAmerica, IssueVoter, and OpenPD shared their projects, and we heard from seasoned experts Nate Lubin (former Director of the Office of Digital Strategy at the Obama White House), Miranda Yaver (political science lecturer at Columbia and Tufts), Lawrence Norden (Deputy Director of the Brennan Center's Democracy Program), Catherine Vaughan (CEO & Co-Founder at Flippable), and Trisha Quan (Senior Engineer, DNC). Then we opened up the mic to anyone who wanted to pitch an idea or make an announcement before we broke into networking. In March we teamed up with Matter for an event focused on the evolution of the democracy tech ecosystem. Micgoat, TheStacker, Vigilant, Grafiti, and Blastchat shared their projects, and we heard from Josh Lucido (Director of NYC Investments at Matter.vc), Rapi Castillo (Founder of ProgHacknight), and Emily Baum (Co-founder and Managing Director of Reboot Democracy). Then we heard some open mic pitches and broke into networking. In November we teamed up with Harmony Labs and The Brown Institute for Media Innovation for an event focused on improving the spread of information in our democratic system. Project Ratio, Buoy Up, The Lamp, YVoteNY.org, and Open Progress shared their projects, and we heard from Alexis Wichowski (Press Secretary & Sr. Advisor at NYC Department of Veterans' Services), James Slezak (Founder of Swayable, Founder and Managing Partner of the New Economy Lab, Former VP and Chief of Operations of the NYT Global, Founding Partner of Purpose), Peter Koechley (Co-founder Upworthy, formerly with MoveOn and the Onion digital), and Mark Hansen (Director, Brown Institute for Media Innovation and Professor of Journalism, Columbia Graduate School of Journalism). Then we heard some open mic pitches and broke into networking. In October we teamed up with Ragtag for a Democracy Tech Meetup in Chicago. Teams shared the projects they are working on and we had a roundtable discussion to identify what support teams most need moving forward. In August we teamed up with Civic Hall to host a discussion on how to increase citizen engagement in our democratic system. The innovators behind Hope, g0v, CommonPlace, Defiant, and Action Map shared the projects they are working on, we heard from a diverse group of speakers, and then we opened up the mic to the room to pitch ideas before we broke into networking. In May we teamed up with The Arena and CHORUS to discuss Running for Office and Election Technology. Teams shared the projects they are working on, we heard from a diverse group of speakers, and we opened up the mic for quick pitches before we kicked off the networking portion of the evening. The Reboot Democracy Hackathon is a non-partisan call to action for people inspired to use technology to build scalable tools that increase citizen education and participation in government, and transform our political system into one that is truly representative and responsive to its citizens. All are welcome, from engineers, designers, product managers, business-people, marketers, investors, etc. We host and promote events that help passionate people connect, learn, and create. Check back for hackathons, happy hours, and discussions about the intersection of democracy and technology. If you have an event that we should promote, let us know!